Snow departs but lingers on roads. Lows in the 20s. A massive winter storm moved through New England Tuesday, dumping a foot and a half of snow in some places and causing blizzard conditions in at least one Massachusetts town. School districts across the region canceled classes, malls and all 79 New Hampshire state liquor stores closed early, cities issued parking bans, and people were urged to stay off the roads. The storm included wind gusts up to 72 mph in Wellfleet, coastal flooding, and power outages. More than 54,000 Massachusetts customers and nearly 52,000 New Hampshire customers were without power as of 8 p.m.
Boston had only received about a half a foot of snow as of Tuesday night, while other parts of Massachusetts saw as much as 18 inches. 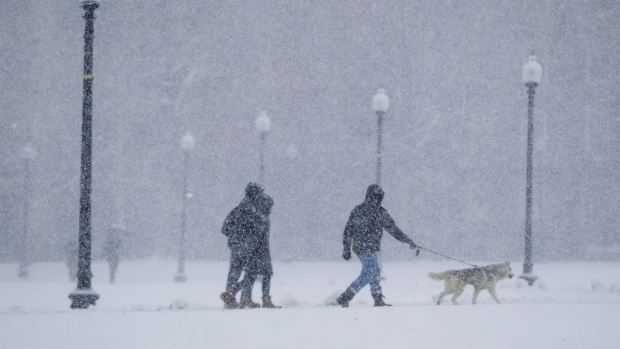 Blizzard conditions were confirmed for Lawrence, Massachusetts, for about four hours during the late-winter storm. Blizzard conditions made for tough travel throughout Massachusetts on Tuesday. Heavy snow and high winds created reduced visibilities and blizzard conditions across interior southern New England. Snowfall rates approached 2 to 4 inches per hour at times on Tuesday. Tuesday's storm brought strong winds and heavy snow to most of New England, especially on the North Shore of Massachusetts. Boston Mayor Marty Walsh said all Boston Public Schools will be closed again on Wednesday, though city offices will be open. A snow emergency and parking ban remains in effect. "It's still dangerous out there," Walsh said. "This is gonna freeze up now." Meteorologist Chris Gloninger has been monitoring the storm in West Roxbury in the NBC Storm Ranger. The mayor said Boston's snow emergency will be lifted at 7 a.m. on Wednesday and the city will start to shift its attention on cleaning up. "The focus right now for all of us is clearing the main arteries, responding to public safety requests, and plowing and salting all of the streets in the city of Boston," Walsh said. While people mostly heeded dire warnings to stay home and off the roads, police said a 16-year-old girl was killed when she lost control of her car on a snowy road and hit a tree in Gilford, New Hampshire. Several dozen other accidents were reported across the region, mostly minor. MassDOT had thousands of pieces of equipment on the roads. The MBTA operated on a normal weekday schedule despite the storm. Local trains leaving Boston's South Station seemed to be running smoothly Tuesday morning, but there were some issues for people leaving or coming to the city. "I was supposed to go to an interview in New York, but my train to New York got cancelled," Graham Shaw said. According to the airline-tracking website FlightAware, more than 5,400 Tuesday flights were canceled, including hundreds at Boston's Logan International Airport. Amtrak also canceled and modified service up and down the Northeast Corridor. Many people appeared to be enjoying the day off on Tuesday. In Leominster, Massachusetts, Bob Penning and Donna Salvi took advantage of light snowfall Tuesday morning to venture outside with their dog. "I love the snow and I get a day off, so I get to go outside and play with the dog and make something yummy in the kitchen," Salvi said. Kelly Erskine, a 28-year-old coffee shop manager from Whitman, Massachusetts, about 25 miles south of Boston, made it almost all the way through the winter without a shovel. She went to Walmart on Tuesday morning to get one. "I live in an apartment complex and they usually take care of the shoveling, but they sent a letter to us and said, 'Expect a lot of snow.' 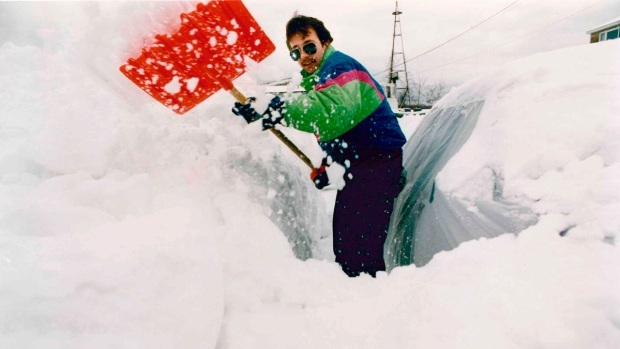 I knew from the letter that I'd have to go out and buy a shovel," she said. The winter storm lifts north across central and northern New England into the evening, bringing an end to the precipitation and dangerous travel conditions across southern New England. Heavy snow and gusty winds continue into the evening and night across the North Country.